HP Slate 7 a new Android Tablet from HP, which was first announced way back in February at Mobile World Congress 2013. HP slate 7 will land in UK on May 1 for the very low price of £129 (Rs. 10,780). 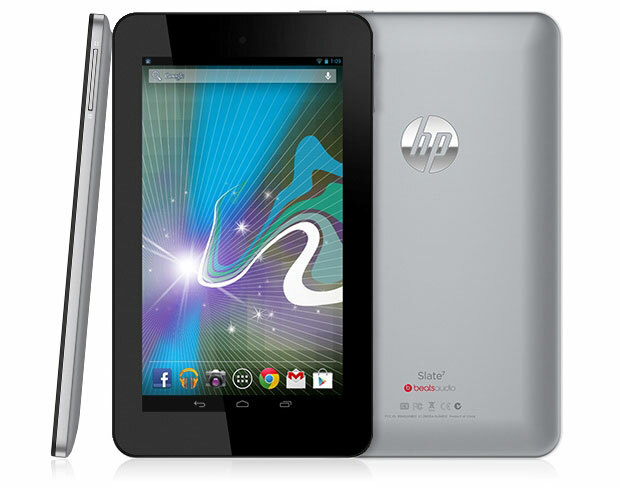 HP slate 7 has come with some good specifications, compare to this price category Tablets. However it has significantly lower specs than Google’s 7 inch Nexus. The HP Slate 7 comes with a 1024×600 7-inch display, and it is powered by the ARM Cortex-A9 1.6 Dual-core processor with 1 GB of RAM. It runs on the Android’s latest os Jellybean Android4.1, Of course there is 4.2 released. It has come with 8 GB of internal storage capacity while nexus 7 has 16 GB. You can get more memory space by inserting 64 GB MicroSD card in the slate 7. The Slate 7 sports a 3-megapixel rear camera and Beats audio tech. This tablet has come pre-installed with ePrint app which will give you the ability print the documents wirelessly to a compatible printer. If you are in the UK, you can now pre-order this tablet, and get it in the week or so. This tablet first will ship to the UK and available from May 1. There is no word about the release date of this tablet rest of the countries. This tablet might create a buzz in India with this lower space and could be a better competitor for the budget tablets in India.